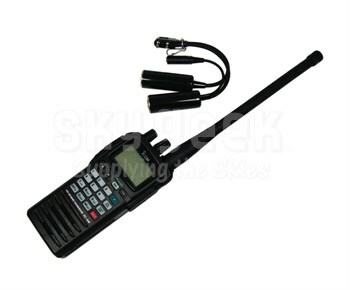 SkyGeek.com proudly offers the ICOM IC A6 220 Handheld Air Band Transceiver (220V Version of the IC-A6, a powerful and compact little device packed with features sure to impress any pilot. Combining simple, intuitive operation with a rugged, reliable design, the ICOM A6 220 is the successor to the A23 and the A5. With a capacity of 200 memory channels and a variety of scanning functions, the storage on this baby is stellar. The ICOM IC A6 features a large keypad and display for fast recognition and easy, one handed operation. The 6-character 14-segment alphanumeric LCD presents recognizable information, and the keypad employs a new channel recall function that automatically memorizes the last 10 channels. Both the display and the keypad are back lit until you turn them off, ensuring maximum visibility during night flights. The flexible antenna will not get in the way, and the non-slip side slit prevents accidental dropping during those barrel rolls.